14343 Features: -Easy roll casters add mobility. -Made in USA. Product Type: -Book display. Commercial Use: -Yes. Country of Manufacture: -United States. Folding: -Yes. Casters Included: -Yes. Primary Material: -Wood. Frame Color: -Natural Birch. Dimensions: Overall Height - Top to Bottom: -48". Overall Width - Side to Side: -96". Overall Depth - Front to Back: -15". Specifications: GSA Approved: -Yes. 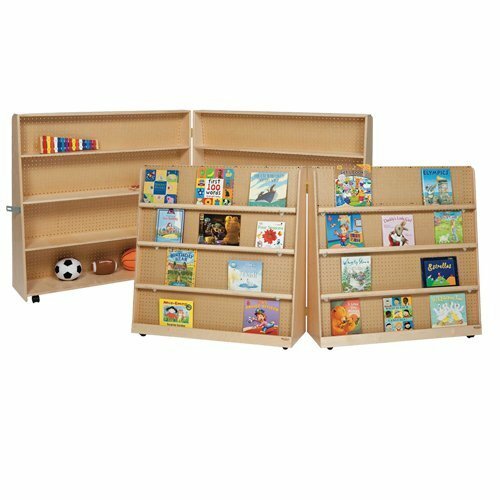 (2) deluxe book displays that fold together and can be securely fastened with a locking hasp. All surfaces and back are constructed entirely from Healthy Kids plywood. Three adjustable shelves on each unit provide versatility while easy-roll casters add Mobility. Promotes a healthier early learning environment. Does not emit any harmful contaminants (VOCs) into atmosphere. Product Dimensions: 50"Hx96"Wx15"D. Product Weight: 162 lbs.